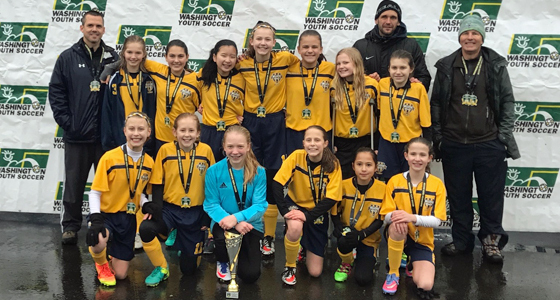 "The girls showed courage and determination to find a way to win..."
(Feb 9, 2017) February 5th was a great day for two Bellevue United FC teams, both coached by Simon Robinson. His teams each walked away with a state championship at the 2017 Washington Youth Soccer Founders Cup. 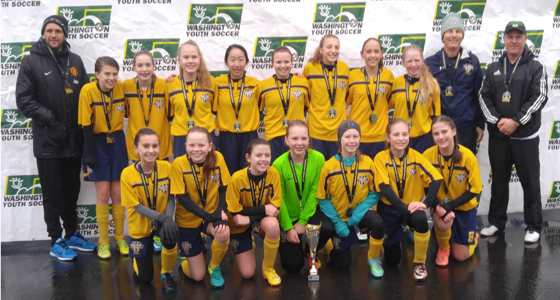 Bellevue United G05 won the GU12 Division; Bellevue United G04 won the GU13 Division in the development-level state tournament open to Select teams. Coach Simon Robinson points out parallels in the two teams' tournament experience, "Both won in PKs in their semifinal matches, and both won 1-0 in the final with goals scored inside the final 10 minutes." The similarities may well have come from their shared history. "Last year the G04 Bellevue team won the state title," he explains. "Due to the change to birth year in 2016, the team was cut in two with half the girls ending up on the G05 team and half on the G04s. We frequently practiced and scrimmaged together, and the girls built a strong rapport. Both teams struggled early to adjust to the changes, but we improved dramatically over the course of the season, and the culmination of twi state championships was icing on the cake of a great year." The girls of BUFC G04 had an exceptional state cup run with a near-perfect defensive record. Not a single team throughout the tournament was able to score against them during regulation play. The GU13s, in fact, earned 38 points, scoring 14 goals with a 14-point goal differential during bracket play to make it to quarterfinals. From there, they won three straight to earn the cup, adding three more unanswered goals. The only goals against them came in the tie-breaker shootout in the semifinal match against a determined FME Fusion G04, where BUFC ultimately prevailed. The BUFC U12s likewise finished at the top of their age group in bracket play, winning four matches with a 23-point goal differential (24 Goals For and only 1 Against) to finish with 39 points, and earn a berth in the playoff round. A 3-0 win in the quarterfinals against NSC Thunder G05 Green propelled them to the semis, where they faced a tough Crossfire Select G005 Gold - Jordan. Their win in PKs sent them through to the finals where they upset another Crossfire Select team, CFS G05 Gold - Reimbold. Robinson gives most of the credit to the team and its supporters. "We had a great team of coaches who helped out, great team managers and two very supportive groups of parents. The girls showed skill and athleticism over the course of the year and, when the going got tough in the semis and finals, they showed courage and determination to find a way to win very physically tough matches. We couldn't be prouder." Patrik Edenholm and Greg Foster assisted with coaching the BUFC G04s; Mike Blackburn assisted with the BUFC G05s. Click here to view complete WA Youth Soccer Founders Cup results.